Is rail moving in the right direction? Is it going to improve service or reduce transit times for freight transportation? How do we ensure accountability across the team amid tight capacity? In this interview recap, we talk about the current capacity crunch, rail insights, and solutions for today’s major logistics challenges. What are the major challenges for capacity? Capturing the price level at what the customer wants to pay is always a challenge. This year is especially interesting because we also have to look at what caused the capacity crunch. A number of factors cause tight capacity like economic growth, the rise of e-commerce, changing customer expectations, shipping inventories, shortened delivery windows in the supply chain, and seasonal peaks. The greatest thing that’s going to impact our industry is the driver shortage. By 2024, we’re going to be short 175,000 drivers. The industry needs to go through some changes. We should look at reducing the driver’s age; recruiting veterans, females, and minorities; or giving tax incentives to relieve the shortage. According to the Bureau of Labor Statistics, the average age of a truck driver is 55 years old. What’s going to happen in the next 10 to 20 years when many of these drivers experience medical conditions that may force them out of the driver pool? How do you stay prepared in the current capacity crunch? Market conditions change all the time. When customers ask for target rates, you have to be educated on what’s happening and keep customers updated. DAT Trendlines gives useful information for vans, flat-bed, and reefers spot rates. Make sure to look at the average rate-per-mile and the fuel cost. Reefer and flatbed rates trended downward last week, but their load-to-truck ratios were high. The load-to-truck ratio can give you insight and trends on freight availability and truckload capacity on the market. We need to monitor those rates to advise customers about freight information in the event of any capacity shifts. What are some challenges for rail service? We have to put the pieces of the puzzle together for the customer, hopefully with the anticipation of converting truckload shipments to intermodal. Then, we present the rate to the sales team, and sales communicates this back to the customer. Yet, during the onboarding call, rail carriers come back with no available capacity. No one had an answer. Earlier in the panel, we discussed accountability, collaboration, and effective communication in the supply chain. But railroad companies certainly don’t want to be held accountable for a situation like this. With today’s rail congestion, their commitment to providing on-time end-to-end delivery is questionable. Rail congestion in the marketplace like in Chicago, which is the major interchange for equipment, is completely backed up. This causes some service delays. What are some solutions to these rail problems? The best option when moving a supply chain is to look at a blended capacity solution. Multiple services and equipment must be available so you’re not dependent on one mode of equipment; your supply chain must be resilient and efficient. At CAI, we look at the lowest landed cost from point A to point B. That might be using more than one mode of logistics solutions such as intermodal, over-the-road trucking, or consistent time-of-day deliveries. We want to quickly balance demand and supply by managing capacity constraints over their entire enterprise. We aim to identify and analyze problems, simulate changes, collaborate for solutions on constraint issues, and align with their business goals. The incumbent may re-adjust their rates, and you might lose. In the long-term, you’re going to have more success with a consultative approach. If you understand a customer’s business objective goals and come back with a plan on how to reduce costs in that period, you earn the customer’s respect and win the opportunity to engage further. What are the biggest changes to alternative logistics solutions like intermodal? Logistics organizations are investing in ramp infrastructure to reduce the time for intermodal customers. A simple one- or two-mile an hour improvement in speed can dramatically impact the service and costs of the railroad. You have to crawl before you walk. Railroads aren’t going to pick up five miles per hour; they can increase only one mile at a time. Not only does reducing time optimize supply chain handling, but it’s going to affect the driver’s hours, service, and the ELD impact. It’s extremely important to have efficient ramps, organized loads, and reduced waiting time for the drivers. Drivers are running out of hours due to rail congestion and rail ramp problems. Looking ahead, what are some future trends to solve for the capacity issues? Right now, there’s no crystal ball depicting what’s going to happen in a year. We’re in the peak season for intermodal. If you ask me if it’s the peak season we thought it would be, the answer is probably no. Platooning fleets is a big buzzword in the industry. This means one driver is managing three to four sets of trucks. But what happens when you platoon fleets across traffic lights going on an interstate? From green to yellow to red, how is that going to work? The driver shortage is also fueling the opportunity for autonomous trucking. A lot of questions took place around advanced trucking to reduce driver stress. There are many parts of the supply chain where autonomous trucking can be useful, like around ports, facilities with a manufacturing plant, and in DCs. Autonomous trucking may relieve some of the pressure of driver capacity, but not across the industry by any means. 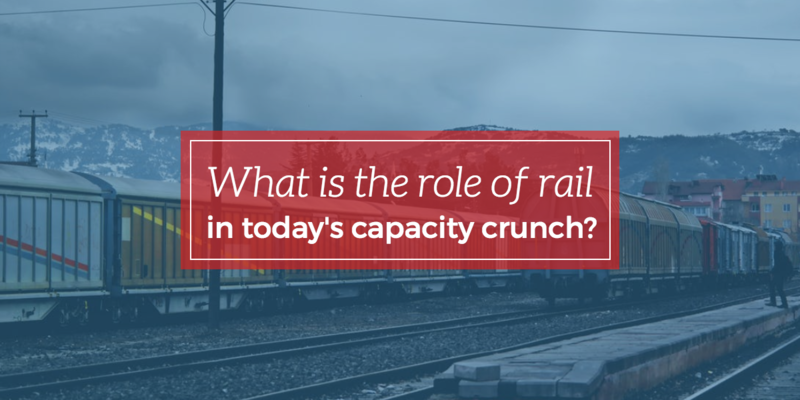 How do you solve today’s rail and capacity problems? We [CAI Logistics] have employees who are very knowledgeable in logistics and have phenomenal working relationships with the railroad executive team. Operationally, the staff knows how to onboard a customer. They take the time to understand the customer’s needs and explain the terminologies—not just handing them a price to secure a business. If we were to make a joint sales call in the next couple of hours with new customers, we would undoubtedly hear the question, “Are you asset-based?” Consider why this customer is asking you that question. Is it financial stability, sustainability, control, or investment in the marketplace? We’re an asset-based company on one side, but we’re non-asset based on 3PL. This gives us some advantages because we have the ability to tap into a hundred thousand containers that are owned by the railroads, XPO containers, and ocean containers. We’re not just focused on our own equipment—we’re a profitable global company with growing assets and multiple links in the supply chain. We take advantage of arranging equipment on a backhaul basis or truckload side and match the customer demand with supply of the industry on an asset-based carrier. If you’re looking for more ways to optimize your freight transportation in the current tight market, download our free guide and get instant access to the best capacity strategies for supply chain professionals.